There are so many seasonal events to be enjoyed at Kings Dominion! As fall begins and the chilly weather is in full swing in most places across the US, people are pulling out their sweaters and boots and enjoying some spooky delights in the cool air. The peak of the fall season is Halloween. Everyone needs a little rest and relaxation at some point during the year, so many people head to amusement parks to experience all the scary thrills and spills that the Halloween season has to offer. With Halloween comes a plethora of spooky attractions across the nation’s theme parks, and Kings Dominion is no different. Here’s a list of the terrifying attractions and events that take place in the fall. Make sure to grab one of aRes Travel’s discounted vacation packages for Kings Dominion! If you can’t wait to lose yourself in the excitement and spooktacular fun at Kings Dominion, the horror-themed mazes are perfect for you. Options like Blood on the Bayou, Cornstalkers, Tollway Terror and the new Condemned are all great ways to get lost in a terrifying world of ghouls and ghosts. There are many new scare zones at Kings Dominion that are sure to get your heart racing. Themes like The Yard, Necropolis, and IronWorX offer all kinds of scares to shock even the bravest souls. These themed areas are a huge part of Kings Dominion’s Halloween spectacular. Of course, there’s plenty going on at Kings Dominion at other times of the year too! 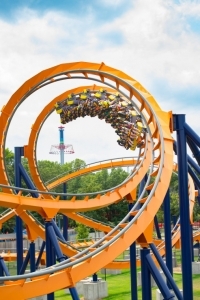 The roller coaster fans can have their fill of white-knuckle thrills at this incredible park. Check out all the favorites like Anaconda, Dominator, the Backlot Stunt Coaster, and the hair-raising Intimidator 305! 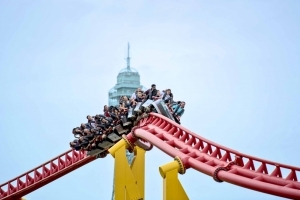 For exclusive deals on cheap Kings Dominion tickets, amazing savings on hotels and packages, and some of the lowest prices on travel, call 1 (800) 434-7894 (international callers use +1 (619) 546-5622) to speak with an aRes Travel planning expert seven days a week, or book online now.